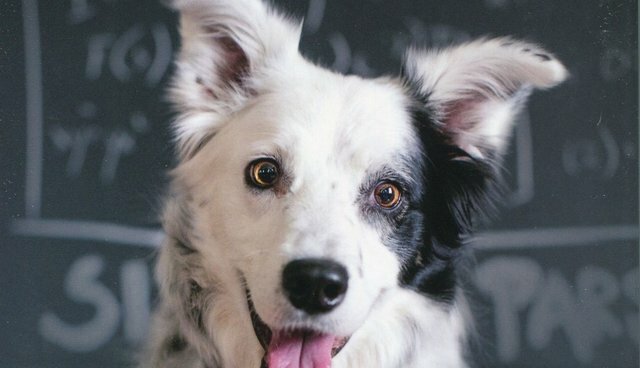 Chaser: Unlocking the Genius of the Dog Who Knows a Thousand Words John W. Pilley First and foremost, Chaser, the lovely border collie who graces the jacket of this fine book, is part of the Pilley family, not just a research animal or entertainment. She has the innate intelligence of her breed, and is therefore a willing and fast learner. Dr. Pilley is a retired professor of psychology with a keen interest in animal cognition. He has read about Rico, a dog who was taught over 200 words, and is certain his pup can exceed that number. But more important, he wants to write a scientifically acceptable research paper proving that canine intelligence is real and should be studied more. Rico's accomplishments were found flawed by the scientific community. Dr. Pilley wants to avoid that pitfall. So he sets about first teaching Chaser names of toys. "Chaser, this is ..." is how he manages to do this. Chaser is eager and needs to have something to herd, so she quickly picks up the names of toys and fetches and herds them on command. By the end of the book, she has 1,022 toys, all of which she knows by name. I was wondering how much longer I should wait when Chaser slowly came around the couch. In her mouth was a plush miniature chair from a dollhouse set...."
Chaser learns other commands that are intended partly for her safety or for her "Pop-Pop" and "Nanny's" sanity, such as "Time out," and "No toy." Her reward for getting a right answer is always playtime, rather than treats. Dr. Pilley makes a strong plea for using more play in teaching our children as well. Chaser's language abilities extend far beyond memorization. She understands syntax and semantics. She can be told to paw, nose, or take an object and bring it to another object, thereby understanding a verb, direct and indirect object. Her accomplishments are always rewarded by play and love. She's not only a brilliant dog, but a very happy one!